Piece Of Paradise! This One Of A Kind Property Feat A Custom Log Home On Approx. 2 Acres W/Backyard Oasis, Lrg Workshop & An Out Of This World Shed! 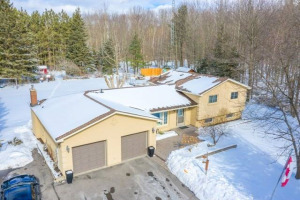 Main Home Feat Vaulted Ceilings, Lrg Principle Rms, Hdwd Flrs, Updated Baths, Spacious Kitchen, Mud Rm W/Ample Storage, Fin Bsmt W/2nd Kitchen, 3 Bdms & W/O To Backyard Retreat! Entertain In Style In The Gazebo, Hot Tub, Pool & Cabana - Wow! Conveniently Located Close To All Amenities & The Hwy - A Must See! 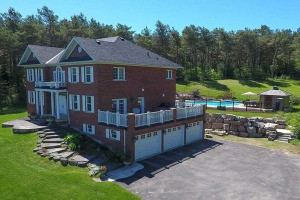 Fridge X3, Washer, Dryer, Bidw X3, Freezer, Elfs, Wdw Covgs, Cac, Garden Shed X3, Humidifier, Pool & Equip, Pool Heater(As-Is, Not Connected), Water Softener, B/I Bookcases, F/Pl In Bsmt, Satellite Dish X2, Hot Tub, Uv Light.